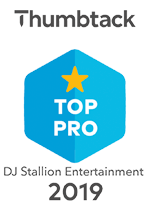 Welcome to DJ Stallion Entertainment! Our DJs are here to make sure your special occasions are truly memorable - no matter the size, venue or audience, we're committed to making your event a success. We pride ourselves in being flexible - we'll change our approach to match your needs. You can hand-pick your favorite songs or give us an idea of your preferences and we'll put together a unique playlist. From Frank Sinatra To Elvis, Dave Matthews to Beyonce, The Beatles to Jay-Z we promise to listen to you - it's all about your style. You'll get great music, great service, and attention to detail. We'll keep your event on schedule so all you have to worry about is how to handle all the compliments on hosting a great party. Music is the heartbeat of any event. Call us now to find out how to make sure your next event is unforgettable. 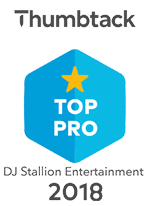 Dj Stallion Entertainment is all about music, with a library of over 200,000 songs we will be sure to fulfill all your music needs & request. 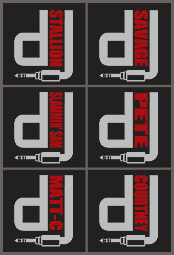 We will always play radio edited versions of songs unless requested otherwise. It's the most important day of your life and you want it to be fun and unique experience for you and your guests. Whether your style is hip and modern or stylish and classic, we'll pay attention to every detail to create custom playlists: your rehearsal dinner will be a blast, your ceremony will be unforgettable, and your reception will keep people dancing all night long. You'll remember this day "as long as you both shall live" – the song that carries you down the aisle, the tune that accompanies a dance with your mom or dad, and the melody that leads your first dance as husband and wife. These are all important parts of your special day. Let us help you find the songs that will make brilliant memory. Whether you grew up listening to The Rolling Stones, CCR. Bon Jovi, Madonna, or M.C. Hammer, each life has a soundtrack. Celebrate a special birthday with a mix of classics from any era and modern hits - a combination that's sure to keep your friends and family entertained. Tell us about the guest of honor and we'll customize a playlist to fit any personality, from fun and flirty to suave and sophisticated. We're here to make sure your next birthday celebration is a blast. A relationship that stands the test of time is definitely something to celebrate! If you're marking one year or fifty, our professional DJs will take you back to the day you got married. We'll customize a playlist based on the year you were married and mix those memorable tunes with modern favorites. Let us help you honor old memories by creating new ones through great music. Whether you're entertaining clients, investors, the media, or employees, carefully chosen music will impress your guests. We specialize in catering to high corporate expectations for launch parties, client events, company socials, grand openings, executive affairs, and a number of other business occasions. We pride ourselves in providing excellent service, professional presence, and attention to detail that will take the stress out of corporate event planning. Set your company apart from the rest. Tell us about your event and we'll use music to take it from boardroom blah to the talk of the town. Your School Event, Private Party, Reunion, Bar/Bat Mitzvah, or other one-of-a-kind occasion should be special. Our DJs are committed to making sure your event is unique. Whether you're celebrating a lifetime of memories or a right of passage, we'll assist you in choosing from our broad music library for the perfect musical backdrop. Should it be interactive and entertaining? Then we'll help with musical games and icebreakers. Should it be smooth and refined? Then we'll select the perfect songs and dress to impress. Want your guest to dance the night away? We'll do the research to find the favorites of any age group and keep your guests on the dance floor. Tell us about your celebration and we'll find a way to make memories through music. All of our Professional DJ's have been working in the industry for over 20 years, with experience at Bay Area Radio Stations, on Mix Shows, Concerts, Bars & Night Clubs they will defiantly make your event/venue memorable. Contact us for details on how to listen to the show.